More than 10.000 objects from the Roman Empire to the 20th Century provide a fascinating insight into the world of locking systems. Gothic, Renaissance and Baroque masterpieces are highlights of the exhibition. On display are keys for guns and keys to lock away indulgence money, locks with musical mechanisms and those which have hidden shooting devices. The unusual widowers’ and chamberlains’ keys also have captivating stories to tell. The exhibits in the collection are primarily from Austria, Southern Germany and Central Europe. There are also a number of objects from China, Tibet, Nepal, India, Persia, Afghanistan and Africa, collected by Hanns Schell on his numerous mountaineering expeditions. The extensive collection of Tuareg locks is truly unique. 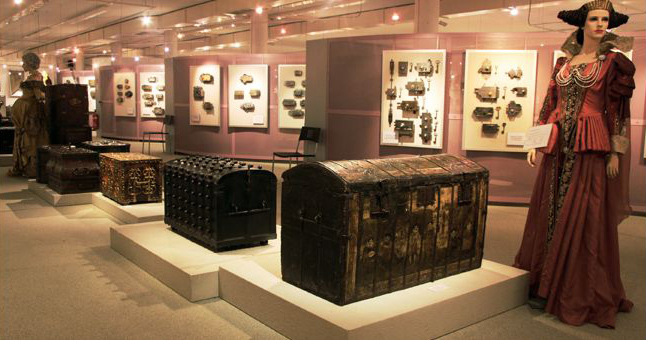 Besides locks and keys, the museum features an extensive collection of antique chests and coffers. Visitors can admire the techniques of artisans from past generations in each of these handcrafted items which range from early Roman bronze and ivory coffers to Gothic prayerbook holders and the early Baroque Michel and Conrad Mann coffers. Other items of special interest are etched iron chests from the Renaissance, several Boulle coffers and the famous Limoges Reliquaries from the Middle Ages. Our collection of wrought iron contains antique door hinges, door knockers and door handles, as well as beautifully crafted iron doors, window gratings, cemetery crosses, and four chastity belts. The cast iron collection on the second floor contains approximately 3,000 exhibits. Objects include a number of items from the foundries of Mariazell and Berlin as well as items from cast iron plants around the world. On display are various religious and secular items used in daily life including iron busts, brooches and badges, and jewelery made of iron. Visitors will also see a number of unusual cast-iron stoves and stovetops. The museum also features an exhibition of Craftsmen’s Guild Signs. The entire collection from Africa and Asia is presented on an additional exhibition space of 600 m2 on the third floor of our museum. Wooden locks of the Dogon and Bamana and carved doors from Western Africa demonstrate various systems of locking from Africa south of the Sahara. There is a large collection of Tuareg padlocks made out of silver, brass, copper and iron. In Asia the focus of Hanns Schell´s collecting is on locks, keys, caskets and doors from the Himalayan regoin. From his numerous travels he brought back exquisitely chased and engraved padlocks from Nepal and Tibet. Large hammered silver boxes from Tibetan monasteries are the highlight of the collection. China and the Indo-iranian Area contribute padlocks in the shape of animals and fine boxes made out of a large variety of materials. Elaborate carved doors from Pakistan and northern India complete the exhibition.